Forsythias (Forsythia spp.) erupt into bloom in late winter and early spring, heralding the arrival of longer days with their delicate, golden yellow flowers. They work well in hedges, foundation plantings and as stand-alone specimen shrubs, where they add visual interest year-round. Healthy forsythia shrubs require little maintenance, although they must be planted under the correct conditions and provided with adequate spacing and care to ensure prolific blooming and long-term health. Most forsythia varieties perform well in U.S. Department of Agriculture plant hardiness zones 4 through 9, although some cultivars are more prone to cold damage than others. Dwarf cultivars, including "Goldilocks" (Forsythia "Courtacour") grow in USDA zones 5 to 8 and are best suited to moderate climates. Forsythias need full sun and fertile, well-draining soil to perform well. Choose a site that gets six or more hours of direct sun each day where water drains away fast after rainfall. Weed and till the site to 12 to 18 inches deep a few days before planting. Work 2 to 4 inches of compost into the top 8 to 15 inches of soil, removing any sticks or other debris from the bed as you work. Water the bed to 12 inches deep, letting the soil settle and the water drain off before planting. The proper spacing for forsythias depends on the cultivar and the shrub's role in the garden. Take into account the mature spread of the cultivar to determine its spacing. Large varieties should be spaced roughly 8 to 10 feet apart, while dwarf varieties need 2 to 4 feet of space. Most forsythia shrubs have a rangy or sprawling shape that works best in informal shrub borders, but they can also be grown as hedges if spaced close together. Space large and medium-sized cultivars that are appropriate for hedging 4 feet apart, then prune them regularly to keep them in check. Forsythias can be planted in spring or fall in most areas. Plant in spring in colder climates where extreme cold is common. A wide planting hole encourages a healthy root system, so make the planting hole two to five times wider than the shrub's nursery container and of the same depth. Remove the forsythia from its pot and inspect the roots before planting. Make three or four 1-inch-deep slices down the root ball from top to bottom if the roots look tightly packed or are circling the root ball. Position the shrub in the center of the hole and spread out the roots with your fingers. Have a helper hold the trunk upright while filling around the roots, then water 12 inches deep to settle the soil. 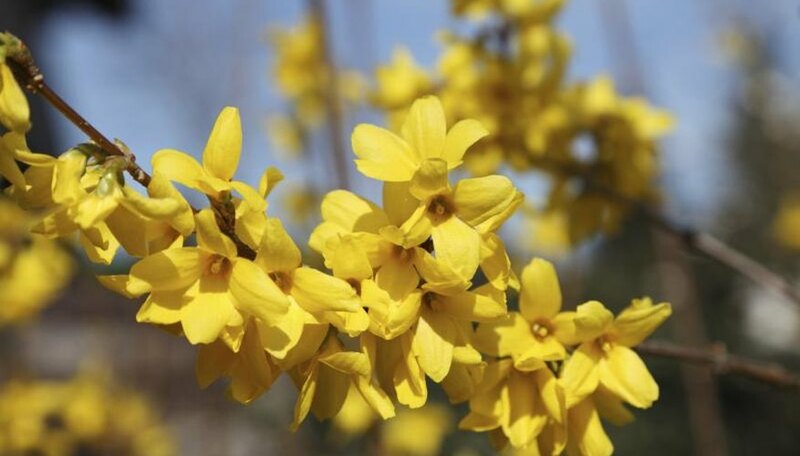 Regular care after planting will help forsythia shrubs establish quickly, which helps ensure their long-term health. Raise a 3-inch-tall soil ring in a 3-foot radius around each shrub to direct water toward the roots. Spread a 2- to 3-inch-thick layer of lightweight organic mulch inside the soil ring to help conserve soil moisture and suppress weed growth. Provide 1 inch of water each week, moistening the top 6 to 15 inches of soil at each watering. Forsythias grown in sandier soil need 2 inches of water each week in two, 1-inch doses. Always let the soil's surface dry out before you water the plant again.